Matthew Grauff (standing), a former member of the Seaside High School's CYBORG Seagulls, is trying to start a team at Astoria High School. Astoria High School students (from left) Tyler Gagnon, Issi Wilcox and Matthew Grauff assemble a donated drill press they will use to build a robot as part of the FIRST Robotics Competition. For the past three years, Astoria High School senior Matt Grauff has traveled to South County rival Seaside High School, where he was an engineer with the CYBORG Seagulls, a competitive robotics team with the international FIRST Robotics Competition. For his senior project, Grauff is captaining an effort to start a team in Astoria, nicknamed the River Bots, for this year’s international competition. 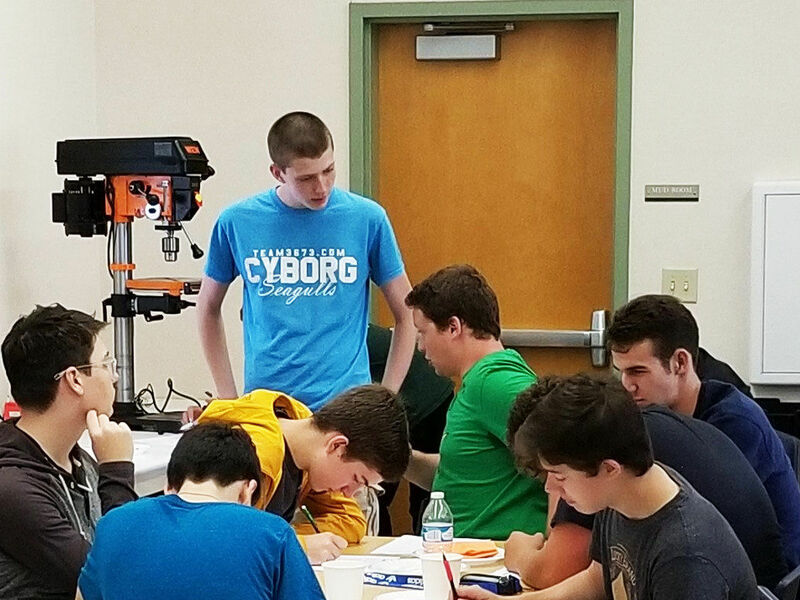 FIRST, created in 1992 by Segway inventor Dean Kamen, annually challenges high schoolers from around the country to build a robot to complete a specific mission. “The first Saturday of January, they announce what the year’s challenge is to all the teams in the world at the exact same time, and then you have exactly six weeks to build a robot that will fulfill that,” Grauff said. Advising the team is Cris Wilcox, a parent of three students and a former manufacturer with the Oregon Air National Guard’s 173rd Fighter Wing in southern Oregon and Intel who moved to the area several years ago. “When I first moved here, I was surprised there wasn’t already a robotics team in the area,” she said. One of Grauff’s earliest teammates was her daughter Issi, who said she became interested in the team after growing up watching her mother working on fighter jets, seeing her cousin compete in the FIRST competition and building Lego robots at Astoria Middle School. Grauff spent the summer reaching out to more than 50 businesses and individuals, raising more than $5,000 to fund the team, which received another $5,000 in startup money from the district. After putting out word over the summer, more than 20 students showed up at the high school interested in joining the team, he said. By mid-November, the team needs to solidify its membership, find several adult mentors and pay $11,000 to register with the competition, after which they receive a robotics kit. FIRST provides a kit to build an entire robot, but encourages teams to budget and buy their own specialized parts. The River Bots are hoping to raise a total of $23,000 in grants and donations to cover registration, building and travel expenses throughout the competition. With no coding classes at the high school, the team especially needs computer-savvy mentors. One adviser is Clatsop Community College physics instructor Pat Keefe, who oversees an underwater robotics team through Marine Advanced Technology Education that draws students from local high schools.